There are many things in life I appreciate. I appreciate ideas that can help motivate people. I appreciate methods that can help build clarity and purpose, I appreciate ways to help people look at new situations in a different way. I also appreciate a fantastic bargain. thus when I saw Scott Hanselman’s tweet late last week that “Getting Results the Agile Way” by J.D. Meier was available that day for free as a Kindle download, well, I had to jump on it. Many of us in the software development and software testing sphere are familiar with many of the aspects of Agile software development. We think of things in aspects of collaboration, sprints, stories, small iterative deliverable items, and continuous evaluation and improvement over time. these seem like excellent topics for organizations, and many organizations have done well to adopt them. Many of us who work in these organizations often use these techniques in our work life, but we shut it off when we leave the office. J.D. asks a basic question… why? If Agile is such a great approach for developing software, why don’t we use it to develop the rest of our lives? This in part is the primary message of “Getting Results”. It’s the idea of making ourselves agile by using Agile techniques. When I use small “a” agile, I mean the actual ability to be nimble, adaptable and having the ability to change course and approach easily and quickly. When I use large “A” Agile, I’m referring to the methodologies that are associated with the named practices. Note, “Agile Results” is a registered trademark. It’s a system that is being marketed. Don’t be distracted by that premise. Think of it as similar to “The Total Money Makeover” that Dave Ramsey offers and espouses. It’s his system, but the system can be tailored and modified to meet your own individual context and needs. You could practice it lock, stock and barrel, or you could take a few ideas and try them out to see how they work in your own particular world. The idea behind Agile Results is a simple and lightweight framework that lets you get control over your day, week, month and year. If you’re using something already that works for you, the Agile Results approach is not meant to supplant them, but give you some additional tools to better use the tools you already have. The key to agility is that, when things change, you need to be ready and able to change along with them. Instead of having a big to do list that you just grind away at, open up and focus on areas that have needs (so called “Hot Spots”) and leverage your strengths and weakness to achieve better and more meaningful results. If there’s any one core element to take away from this approach, I would have to say that it is “the rule of three”. Think of every thing you would like to accomplish, and break them out into four distinct regions; the day, the week, the month and the year. Now for each of those, think of the three things you most want to accomplish in each. If you want to just sample this idea, start with one day. What three things would you be really happy about if you were to complete them today? List them, visualize the outcome you want, and then time box and focus specifically on those areas to get them completed. If you do all three and still have energy, bite off a fourth thing, or more if you have it in you. Stretch this idea out to a week (what three things do you really want to accomplish this week), then to a month (what three things) and then to a year (again, what three things). The day level is, of course, an immediate view. The week level is a 500 foot view, the month is 15,000 feet, and the year, well, let’s picture that guy jumping out of a balloon at the edge of our atmosphere, shall we :)? The book is split up into several sections. the first part explains the system and the bare minimum to visualize and try it. The second part goes into details for each given regional focus (day, week, month, year). The third part discusses benefits and challenges that can help us maximize the effectiveness in the areas where we are strong, and identify areas that we may have weaknesses. It’s tempting to think this is just about work results, but it’s not. This model allows people to focus on may regions of their life (the so called “hot spots” such as home, relationships, work, fitness, mental health, spirituality, fun, etc.). The fourth section is a rather large Appendix that reiterates many of the areas and makes them available as reference checklists and templates. There is definitely a feeling of repetition and covering the same material as you read through the book. That’s by design, and while it might be a put off for some, don’t be so quick to shuffle through. It’s meant to start out bare bones, and then to give you an area to consider later on in greater detail. why? Because for many of us, we will not be hit with everything on the lists as challenges at the same time. Some areas we are naturals at, other areas we may need more hand holding and guidance, and it’s different for everyone, and it’s different for the same person at different points in time and in different aspects of their lives. J.D. is aware of this, and again, this is by design. You may find yourself skimming these areas, and that’s OK, but don’t be surprised if you come back later and read them more in depth. 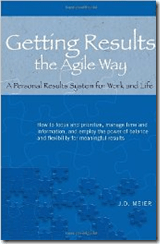 “Getting Results the Agile Way” is a focus on balance, and on outcomes rather than processes. this book will not provide the same rote template for everyone, nor should it. If you currently have a system, you may find these ideas may enhance it. If you don’t have a system, this is a pretty neat and low maintenance approach. Either way, give the ideas a spin, or check out http://gettingresults.com/ to see more of the ideas in action. No purchase required :).